jai yen refers to cool or a calm heart. Let your heart be cool, go as you need to go and do as you need to do. It can be so easy to get frustrated with our work or our colleagues. A cool calm heart can help us and contribute to our relationships as we work together to achieve results. mai pen rai refers to it’s OK. It doesn’t matter, no worries, or it is what it is with a relaxed calm gentle acceptance of life. Don’t confuse acceptance with acquiescence. This does not mean that you don’t care or don’t make changes rather it accepts what is going on with the ability to move forward. I believe the fusion of jai yen and mai pen rai invite a lot of kindness and connection to our work. sanuk refers to fun or striving to experience satisfaction and pleasure from whatever you do with a sense of play, humor, and fun. Can you blur the lines between work and play and bring a playful perspective to who you are and what you do? 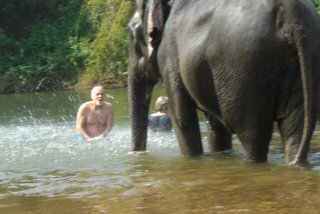 I experienced a lot of caring and gentle teasing in Thailand and experienced stronger connections with people through teasing and a playful approach to whatever we were doing. Remember the elephant and never forget at work to keep a calm heart, accept whatever is going on, and engage a playful approach with everyone at work. David Zinger never thought he would meet Babar and he will always remember the afternoon spent playing with his family and elephants. He works with organizations and individuals to improve employee engagement. His writing, speaking, coaching, and consulting focus on helping organizations and individuals increase employee engagement by 20%. David founded the 3360 member Employee Engagement Network. The network is committed to increasing employee engagement 20% by 2020. Contact David today to increase engagement where you work.